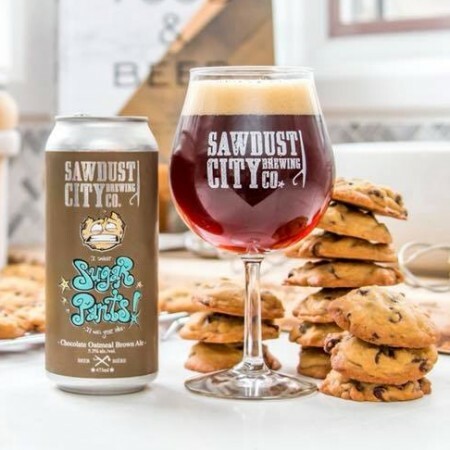 GRAVENHURST, ON – Sawdust City Brewing has announced the return of a seasonal release that is intended to represent a chocolate chip cookie in beer form. Pouring a robust and enticing brown, this malt-forward ale leads with delicate aromas of spicy cinnamon and luscious vanilla. The flavour is rich and fully-loaded with cocoa, roasted malt, nuts and doughy baked bread. A great ‘pint’ with a silky smooth body, best enjoyed in the company of another one. This year’s edition of Sugar Pants will be released on Thursday January 25th, and will be available at the Sawdust City saloon and retail store, as well as select craft beer bars in Ontario, while supplies last.